Within today’s retail advertising landscape, Google and Facebook are the leading platforms for paid advertising. In this post, we look at both Google Product Ads and Facebook Dynamic Ads and provide a thorough picture to help you decide where you should invest your advertising budget. By understanding the reach, metrics and success rate of these platforms, you can identify which out of Google Product Listed Ads (PLA) and Facebook Dynamic Product Ads (DPA) best suits your product and business growth. What are Google Product Listing Ads (PLA)? Google’s Paid Shopping Ads program or Google Product Listing Ads (PLAs) comprises of Shopping data feed, the Google Merchant Center dashboard and the PLAs campaign section of Google AdWords. Google Product Listing Ads (PLAs) appears on top of Google’s search engine whenever anyone searches for a relevant keyword for that product. By aiming to catalogue products based on categories, Product Listing Ads (PLAs) serve as an important tactic in getting brands & retailers visibility on the web. Depending on the type of keyword or product you are searching, Google displays relevant products on your screen. The results are mostly intent based, driven by keywords. Search Results for Leather Boots (above) and Cameras (below) displays the following PLAs on Google Search Engine. In March 2018, Google introduced its new ‘Shopping Actions’ feature. Partnering with giants like Target, Walmart, and now Amazon, Google aims to provide a single space to retailers with the help of a universal check-out for customers. As opposed to a PPC model, Google PLAs under the new feature now operate on a Pay per Sale (PPS) model. This feature makes a lot of sense to retailers trying to break through to consumers in a competitive space. What are Facebook Dynamic Product Ads (DPA)? Facebook Dynamic Product Ads or DPAs advertise your product or service automatically lifting the images and data from your feed. It displays it to customers who have expressed interest in your website, app or anywhere else on the web. With Facebook Dynamic Product Ads each ad is specially formatted for your shoppers according to the keywords they search. As the name suggests, Facebook’s Dynamic Ads, compared to Google are more dynamic, with active Call to Actions. 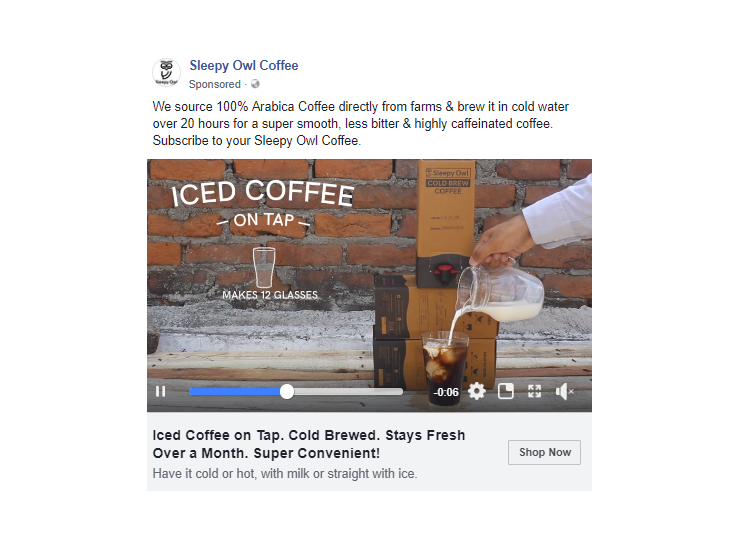 The Shop Now features on personalized Facebook ads serve as a tremendous CTA for driving traffic and making conversions. Not only this, the button is customizable. Facebook is also doing away with its redundant metrics identified as outdated or infrequently used commencing July 2018. As a result, the Facebook platform will be more optimized for measuring business outcomes or providing actionable insights on creative, audience and optimization strategies. Although both Google and Facebook Ads eventually land users to the product’s landing page where sales transpire. Being a search engine, Google’s target is always ‘hard conversions’. If your goal is only to sell a product, it makes sense to invest in Google’s Shopping Ads. Whereas Facebook Ads have a plethora of use cases from awareness, knowledge sharing, to branding and marketing. 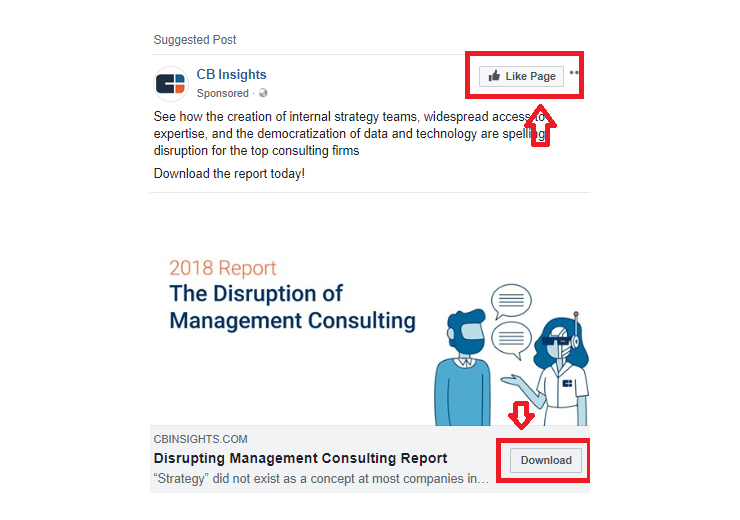 If your end goal is to ‘spread the word’ about your product, get downloads on your latest E-Book or get more page visits, likes, shares etc., without a doubt, go with Facebook’s Dynamic Ads for your products. It has more room to play around and lets you go beyond ‘just making a sale’ with customers. Google Ads are more intent based. Meaning, someone coming across your ad, was actively looking for that product. This is the biggest difference between the architecture of the two campaigns. The search results for Google PLA depend upon the keywords entered in the search engine, according to which results or ads are displaced. On the other hand, Facebook ads appear based on the past search or behaviour of a user, meaning they are experience based. For instance, someone who has visited your website to buy a T-shirt but bounces, you know they are potential buyers. So, you run a campaign to increase their chances of coming back after they see a dynamic Ad in their Facebook feeds. A major chunk of advertising for both focuses on visuals. For Google, this is only restricted to one (the best one) product image with a white background, which it automatically pics from the campaign’s data feed. Both PLAs and DPAs focus on imagery to capture consumer attention. Along with the content and product information details vis-à-vis text, both Google and Facebook focus on image quality and appeal. The platforms follow different protocols when it comes to making information in a standardized format. As per Google’s technical requirements, 100×100 px for normal images and 250 X 250 px for apparel is required. Product catalogue pictures are only allowed with a white background with no overlays. On the other hand, a visually powerful Facebook supports dynamic and creative ads. It allows users to choose up to 3 images and supports text overlays as well as lifestyle photography. What is more noteworthy is that Facebook allows you to get creative with all the images by allowing you to put overlay text. As a result, Facebook is a more relevant ‘marketing’ channel for your products where you can display ads with images, texts, overlays, offers, etc. Whereas, Google is purely a shopping channel which fosters hard conversions by solely listing products with high-quality images. Both eventually take you to the product’s landing page, where the buyer makes the decision to buy a product or service. But in both cases, it is rudiment that you improve your AdWords landing page experience, to make the campaign a successful experience for the shopper. Google’s reputation as THE platform for searching products stems from its policies and strict adherence to its AdWords guidelines. With over 20 attributes required to register products and only accepting data feeds in the form of Txt and HTML, Google Ads also restricts its space to 4 GB. Facebook accepts Txt, HTML, CSV, and TSV while offering more space (8GB) and demanding fewer attributes as compared to Google. When we look at the design of these platforms, it is evident that Google is a search engine, while Facebook a social platform. However, both are the top choices when it comes to paid advertising currently. Google AdWords is great for targeted advertising, while Facebook is great for marketing, branding and in general, raising awareness about your products or services. In Google, someone who is entering the keyword, looking for specific products, is more likely to make a purchase. While on Facebook, someone who has previously shown interest in your website, product or service, will be more likely to sign up, shop now or like your page after coming across your dynamic ad. Facebook is for a broad segmented audience. Creating ads to drive people to your landing page can involve a blog post or a small video, driving to the website, gaining awareness. With Facebook DPA, you can target a whole category segment such as sports, lifestyle, apparel, insurance etc. and direct them to your educational page first to eventually make them convert into a customer. Google, on the other hand, is for specific products and categories, as opposed to entire segments. As per WordStream, 64.6% of people click on Google ads when they are looking to buy an item online in 2016. A well-orchestrated digital product shopping ad through Google’s channel has a high chance of making a sale. 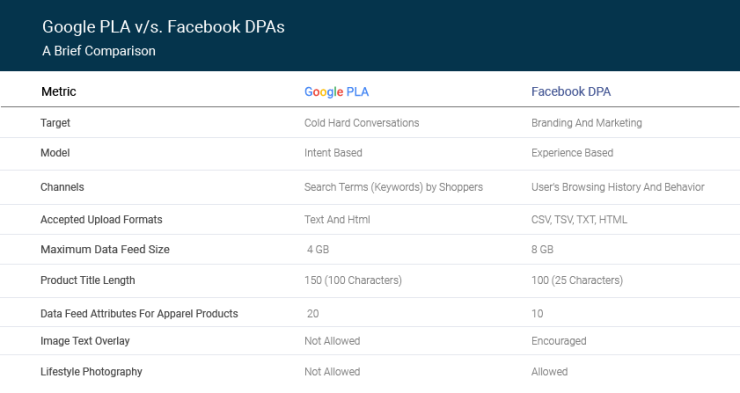 Depending on the spend and the projected ROI from both channels, you should use both Google PLA and Facebook DPA for your campaigns. While you can also submit same data feeds to Google and Facebook, it is always advisable to tailor your product ads for both channels to gain maximum retail exposure for your products.